A bust in need is a friend indeed! I’m long overdue on my blog updates. Rest assured, it’s because I’ve been busy sewing MORE, not less. 🙂 Regarding the giveaway from my previous post, I’ve only gotten two responses so I plan to hold out a few more days before I decide. Sunday I’ll pick a winner. And on to the sewing! One of my good friends (we’ll call her “C”) has a BIG challenge when it comes to bras. She’s very large busted on a very small frame and there are almost no bra options for her on the market anywhere. Add to that the fact that she’s a dedicated nursing mother, and needs maternity bras, and the field is narrowed further. Prior to her current pregnancy, C tells me that she was wearing a size 30JJJ. She paid $90 for her bland ivory bra, and despite the fact that it’s the only nursing bra she’s ever find to fit her, it’s painful to wear. That was before her current (fifth) pregnancy. Now the bra is too small. In actual fact, hearing C’s story was part of what prompted me to move from just thinking about bra making to actually DOING it. I complain about the challenges of finding clothes that fit me, but the truth is that on the whole I’m happy with my bust. It’s a good size for my somewhat overweight frame, and if anything helps to compensate for my belly. I may have to drive a bit further or pay a bit more to buy a bra that meets my ample needs (or, more recently, learn to make my own! ), but I have always been able to find something in the end. On the other hand, C is at a point where her bust is actually impacting her quality of life. Her bras are so uncomfortable that she hates to wear them, and largely avoids leaving her house rather than have to deal with that discomfort. So, once I’d made a few bras of my own, I offered to help C find a solution to her rather large challenge. To complicate matters just a tad, C and I live about a thousand miles apart. I am relying on C and her husband to provide me with good measurements and photos to even attempt a worthwhile custom fit! To start, she sent me one of her current bras (which is what you saw pictured above) to copy… figuring we could alter the pattern as needed and go from there. Cloning a bra is easier than I’d expected. I stretched out the individual pieces of the cups and pinned them down along the seamlines, and then took the resulting shape, added seam allowances and elastic allowances, and used the resulting pattern pieces to sew up a bra! (Though, in C’s case, I lengthened the now-too-short band a bit, and added some extra depth to the now-too-small cups). 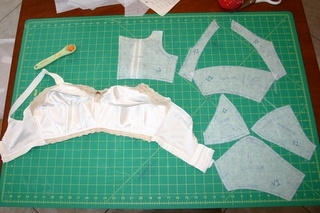 You can see the original bra with the resulting pattern pieces here. The resulting bra was remarkably similar to her original. While it fit a bit better in the band (and a bit too large in the cups) C told me the new bra was uncomfortable in much the same way as her current bras “It’s almost identical to the pain my other bras cause, so you can rest assured that you made a very close copy of a $90 bra!” And for all that it’s a much prettier color, pain is pain and we’re proceeding from here. Bra #2 is half finished and waiting on my cutting table now (I got as far as I could and had to pause to wait for a supply order). I’m trying something quite a bit different for this next one, to hopefully address each of the causes of discomfort C and I have identified. I’ll update with photos and feedback once it’s completed and sent to her!